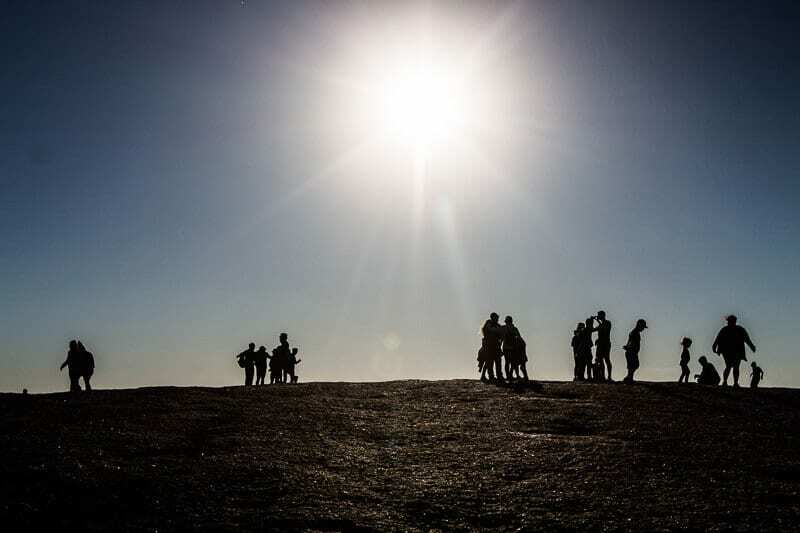 Tips for Climbing Enchanted Rock Texas - A Spiritual Place! As soon as we rounded the corner at the top of the hill, the large pink granite dome rock pulled us into its vision. Just like its name promised, I was enchanted. I immediately thought of Uluru in Outback Australia – a rock far more striking rising out of the desert floor, but holding a similar magnetic power. This is a spiritual place in Texas. 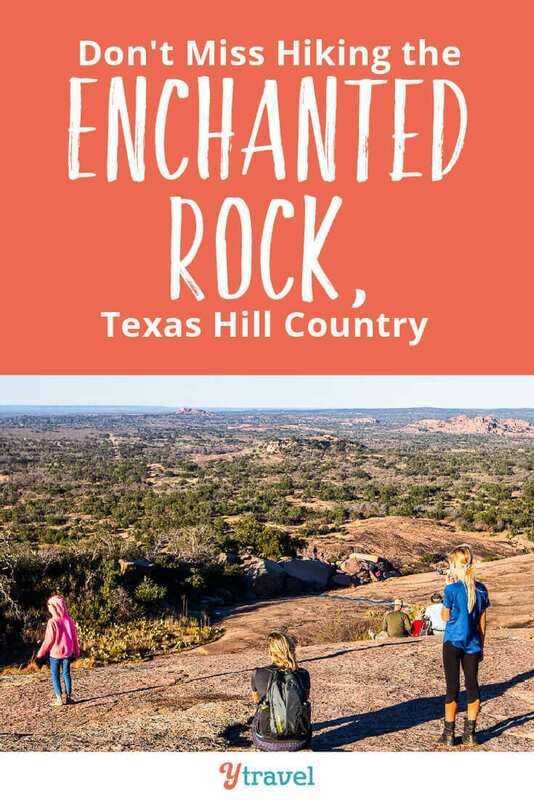 The Enchanted Rock Texas has thought to be a spiritual place for the local Apache and Comanche tribes for hundreds of years. I could imagine this would be a place to climb in solitude and look out at the landscape and contemplate. Find peace and inner wisdom. I found a spot with little people in the way of my view on top of the rock to do the same. I felt like I was back in Australia where vastness surrounds you and gives you space and silence to connect to yourself. It seemed like everyone was out to find their inner peace and wisdom when we visited during the busy holiday season over Christmas. We arrived at 11am, after a late start (not good), and joined the queue of cars patiently waiting to get into one of the most popular Texas State Parks. 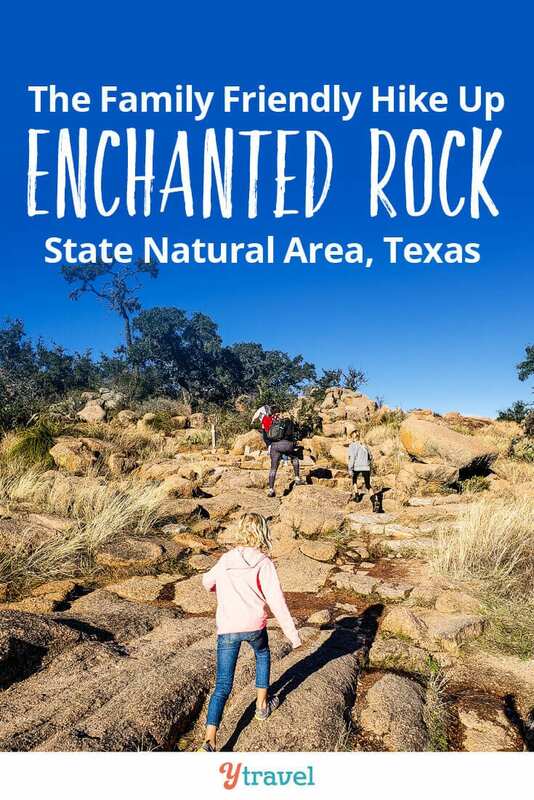 After about 30 minutes we received a pass with the notification that the Enchanted Rock State Natural Area was at full capacity and closed. They would reopen at 2pm and that pass would guarantee us access. We returned at 3pm to another 30-minute car queue before making it in. It’s not that Enchanted Rock State Natural Area is over run with people, it’s just that they have limited parking lots and once they’re full it’s closed. It’s slightly annoying, yet at the same time, I’m grateful they are implementing measures to reduce the human impact on this significant site. The base of the rock is beautiful with a small creek running through, lots of trees, and grassed picnic areas. The climb looks quite steep and daunting as you approach the rock, but it’s really not as bad as it looks. 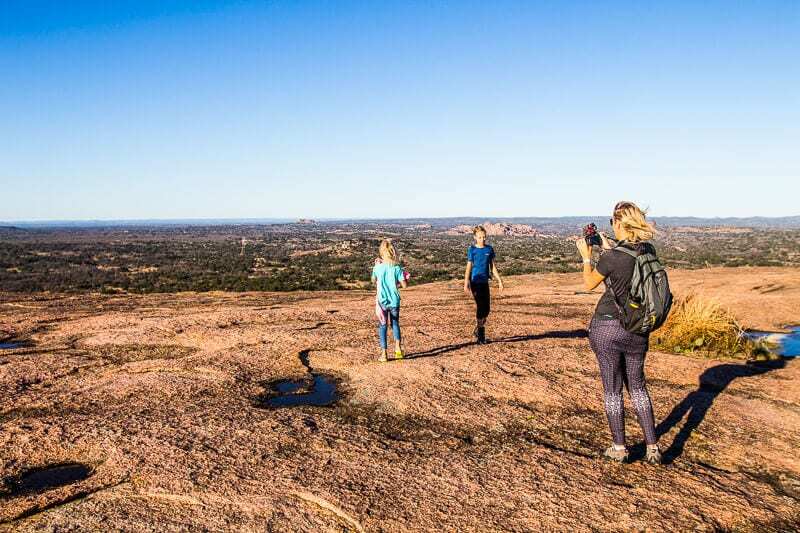 There are a number of hiking trails here, but hiking Enchanted Rock is definitely family-friendly. 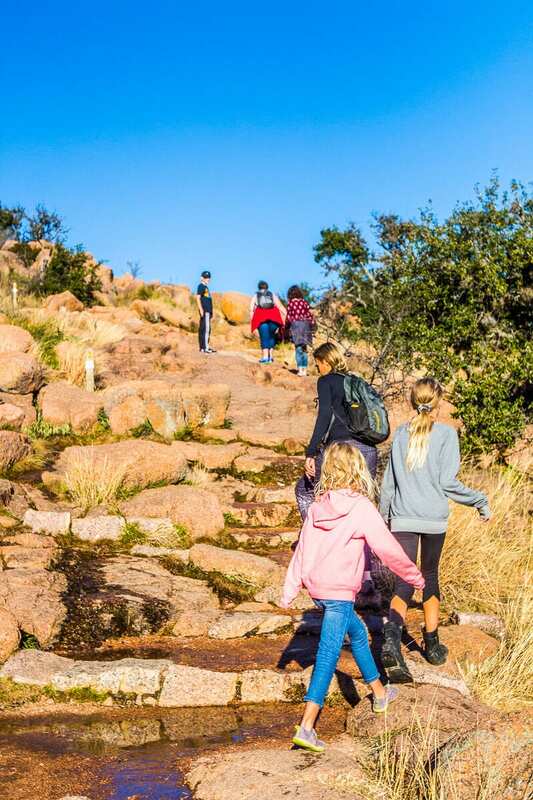 I saw plenty of kids having fun on this rock climb and plenty of dads carrying babies in baby carriers on this Enchanted Rock summit trail. 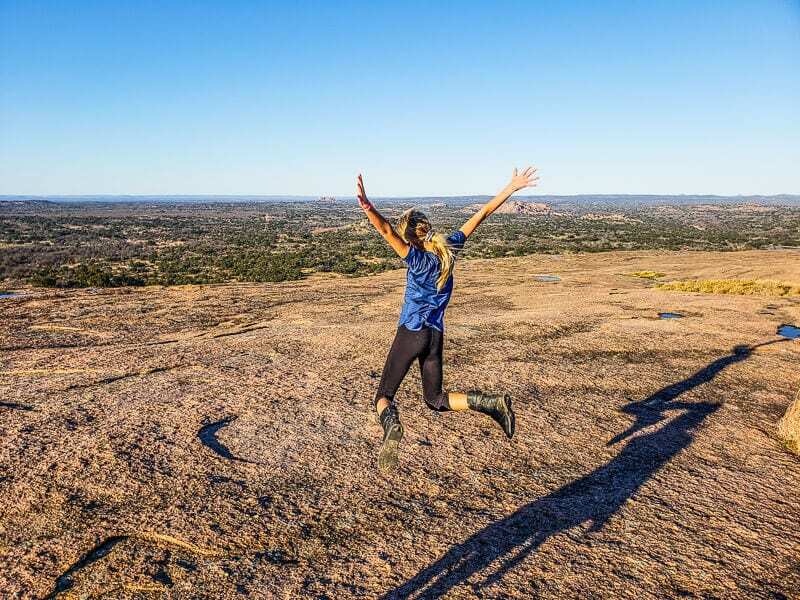 Climbing Enchanted Rock will get your heart pumping and your legs hurting, but it’s exhilarating and your body will love you for it. I’m pretty fit so found it relatively easy and it didn’t take us long to get up to the top. The girls handled it find. Savannah (7) breezed up without a complaint. If you’re not as fit or used to hiking, take it slow and enjoy the views on the way up. Give yourself plenty of time to sit at the top and enjoy the vastness. 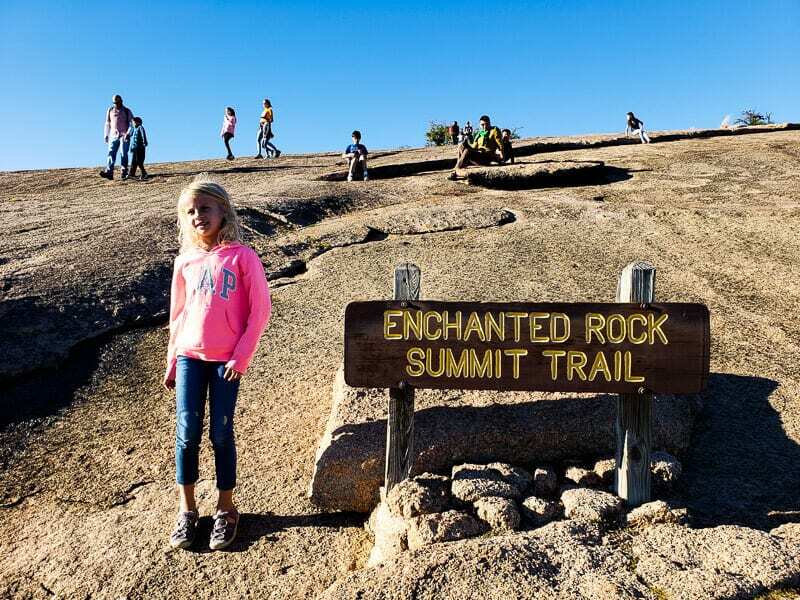 How long does it take to climb Enchanted Rock? It shouldn’t take more than an hour to get up and down. To be honest, I think it was 30-minutes for us actual walking time up and down, but we did stay at the top for longer. There are lots of little pond ecosystems at the top of Enchanted Rock. They are home to tiny shrimp so make sure you don’t step in them and disturb them. I loved the small groves of cactus plants scattered around too. Go down the other side of the rock where you’ll see a clump of rocks and trees. We saw people down there but unaware of what was down there and the girls not wanting to make the climb back up we didn’t go down to have a look. I’ve since learned there are a few Enchanted Rock caves down there to explore. So don’t be like us and miss it. 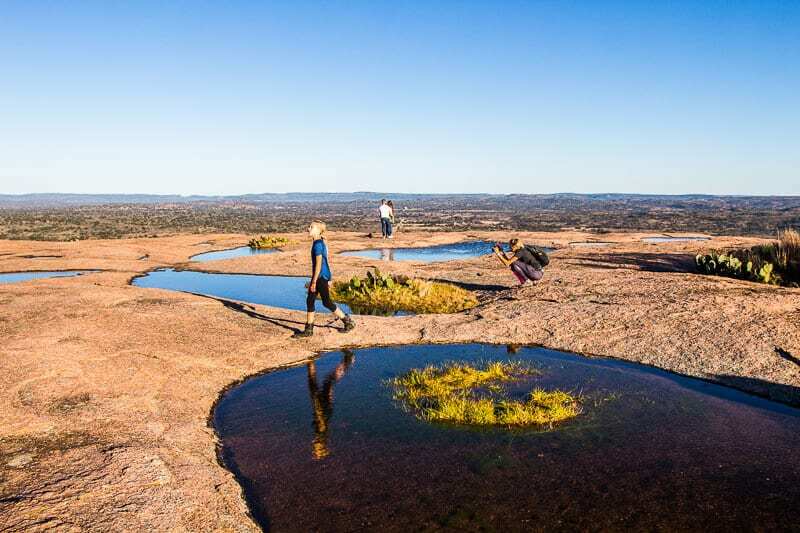 Get to Enchanted Rock State Park Texas early! Definitely before 11am! Americans are usually slow starters so if you get there in the morning hours – before 10am you should be fine. Although we did visit during the busy Christmas holiday season. I’d recommend visiting for sunrise or sunset. It would be so pretty during these times. I can imagine the colors would be glorious. There are plenty of picnic tables at the base of the rock. So either have a picnic dinner or breakfast. They do offer guided hikes to the top. Entrance Fee: $7 for adults, under 12 are free! 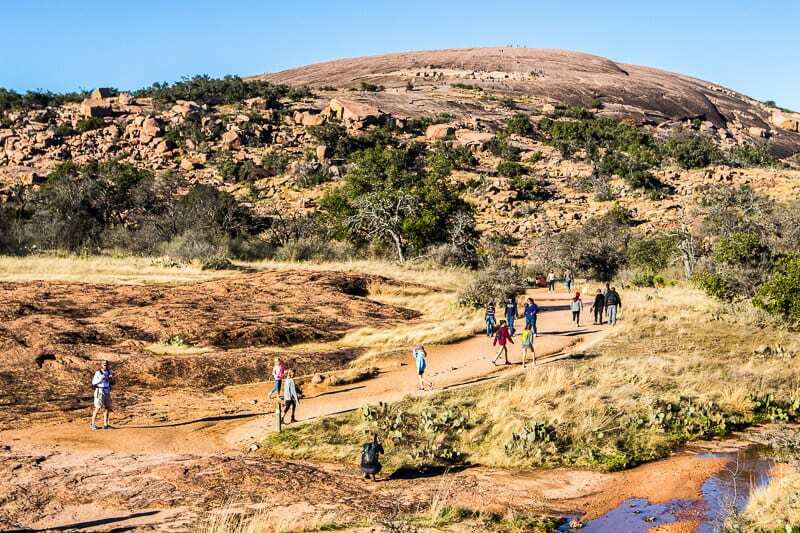 Enchanted Rock hours: Open daily from 8 a.m. to 10 p.m.
It’s faster if you have cash as you can just pay out your car window, otherwise you have to park it and go into the office to pay by card. 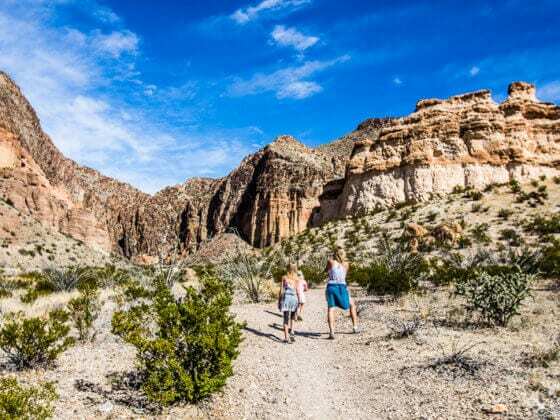 There are 11 miles of hiking trails in the area, including the Loop Trail. All trails close 30 minutes after sunset, except the Loop Trail. And The Summit Trail may close in wet weather. 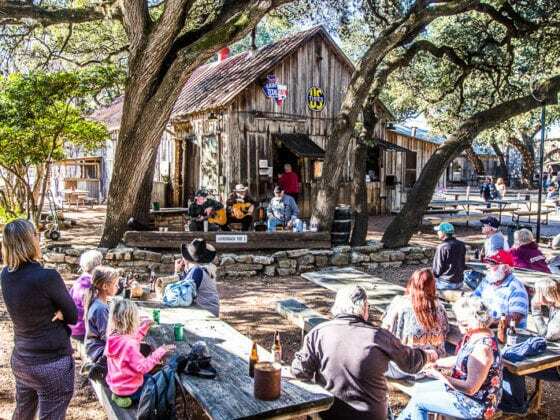 After you’ve finished hiking in Enchanted Rock State Park Texas, head down to Luckenbach to rest under the shade of the oak trees while local guitar pickers entertain you with country music, jokes and local tales. 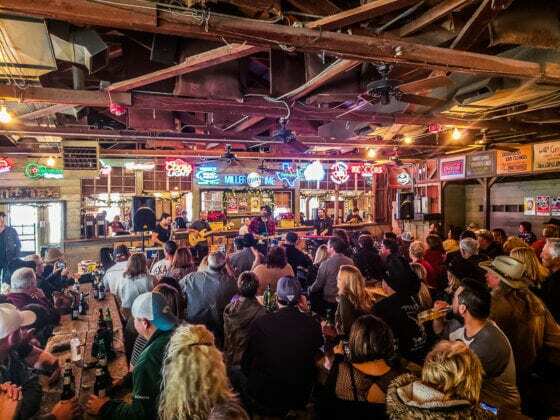 If you like timeless experience and lots of locals in cowboy hats, you’ll love this Texas cultural experience. There are 35 walk-in campsites that allow 8 people per site. Cost; $18 per night plus daily entrance fee. No RVs, pop-ups, or vehicle camping is allowed. Or overnight camping on top of the rock. For all the camping options including primitive backpack campsites, go here. 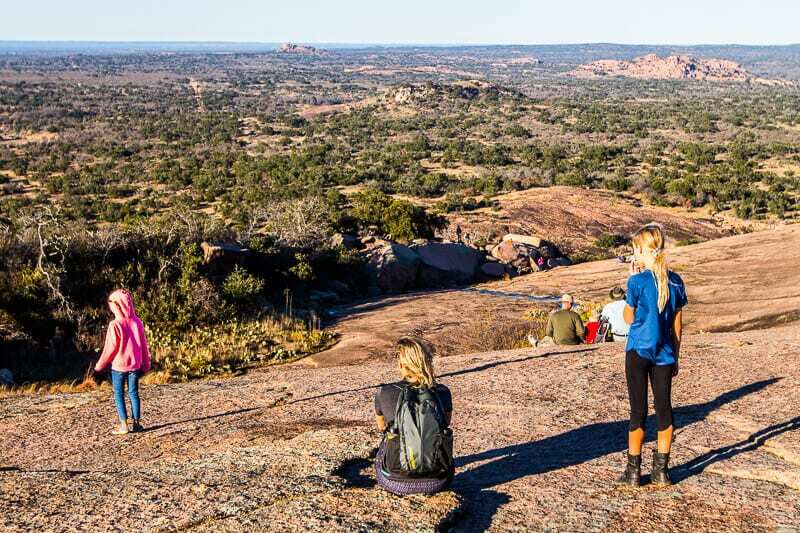 If you’re wondering, where is Enchanted Rock, it’s only 17 miles north of Fredericksburg. We visited Fredericksburg on the same day we climbed The Enchanted Rock, and had lunch there whilst we waited to go back to the rock and use our 2pm pass. 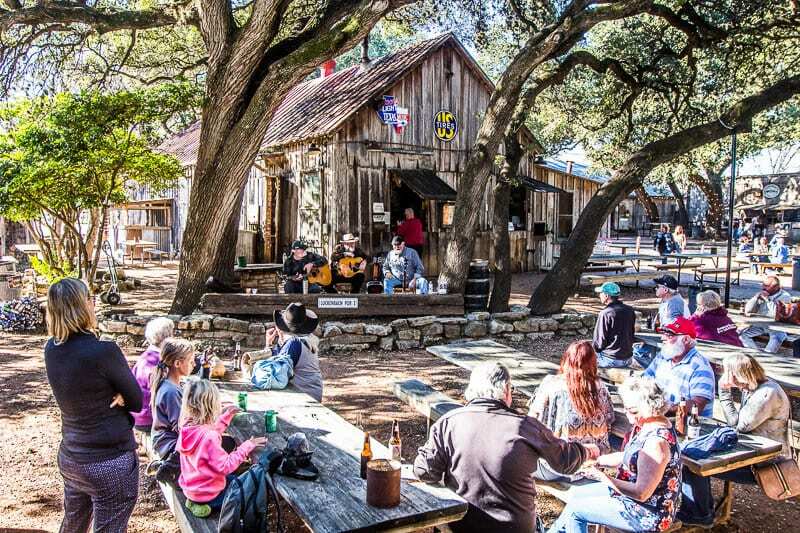 For camping near Enchanted Rock, there are plenty of RV Parks along the River Road. If you’re coming in the summer, I’d recommend camping here. It looks so pretty and lots of fun. 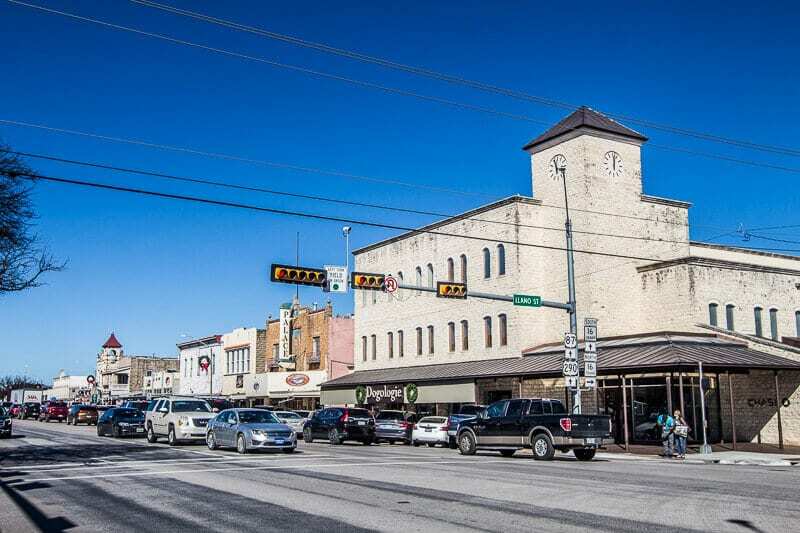 Otherwise, I’d use the New Braunfels area as your base because I liked it better and there is more to do in the area. 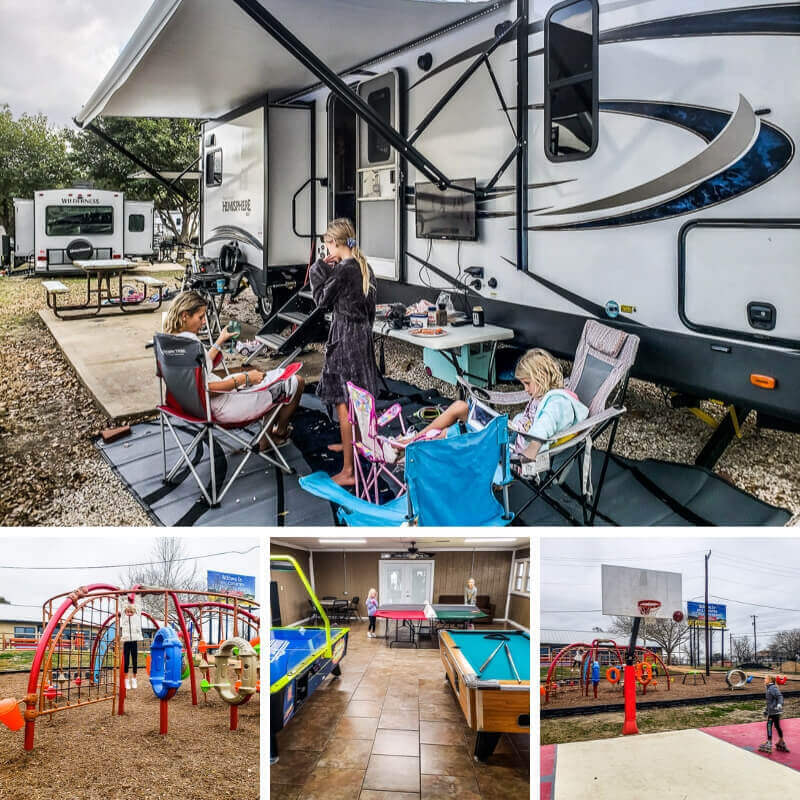 We stayed at the Hill Country Resort & RV Park in New Braunfels which had a lot of amenities like a playground, games room, indoor and outdoor pools and fitness centers. This did make the cost of it a little higher than some others. Our night rate ranged from $51 – $60. You can get discounts for a week long stay, and they also have Good Sam and Passport America discount. 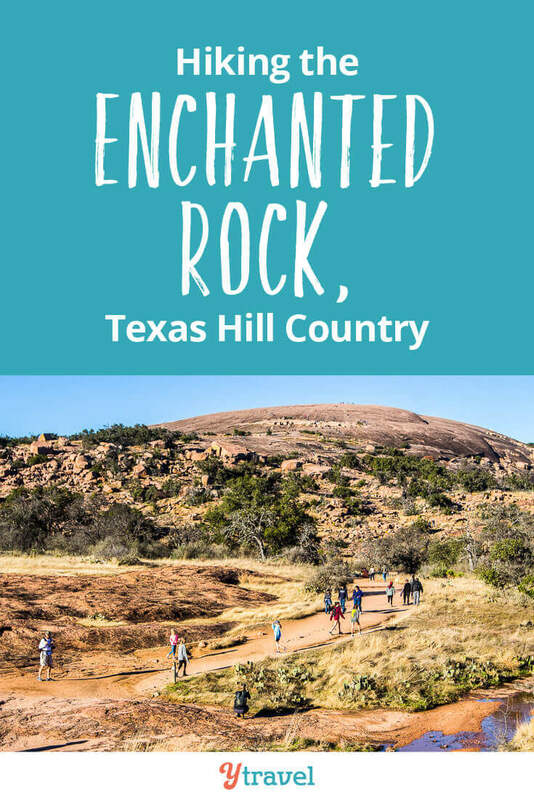 For those who are looking for Enchanted Rock hotels, check out the options in the Texas Hill Country though our partner, Booking.com. We find Booking.com have the widest range of properties, and verified reviews from guests who have actually stayed at the properties! The Peach Tree Inn & Suites – A short walk to Downtown Fredericksburg this boutique hotel offers daily breakfast and an outdoor pool. I’ts also one mile away from Fredericksburg winery. (Yep you could walk!) Read more reviews and book your stay here. A Barn at the Quarry – provides accommodations with free WIFI and a spa center and a hot tub you can use. Continental breakfast is also served on the property, but you get a fully equipped kitchenette with a dining area. It looks cute and cozy . Read more reviews and book your stay here. The Cottages at One Quilt Place – These popular self-catering cottages feature a full kitchen , hot tub, and free Wi-Fi and are located near Fredericksburg city center. Read more reviews and book your stay here. There are also plenty of Airbnb options in the Fredericksburg area. Click here to find the perfect home rental for you. San Antonio is the 8th biggest city in the country and quite sprawling. The highlights for us was visiting the Alamo and the San Antonio River Walk. 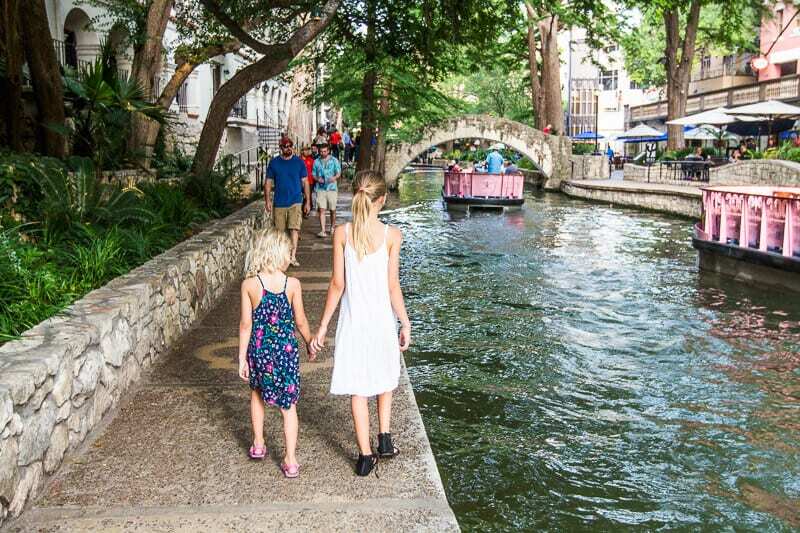 It will save you up to 45% on combined admission price on your choice of 3 or 5 top San Antonio attractions. Buy your Explorer Pass here. 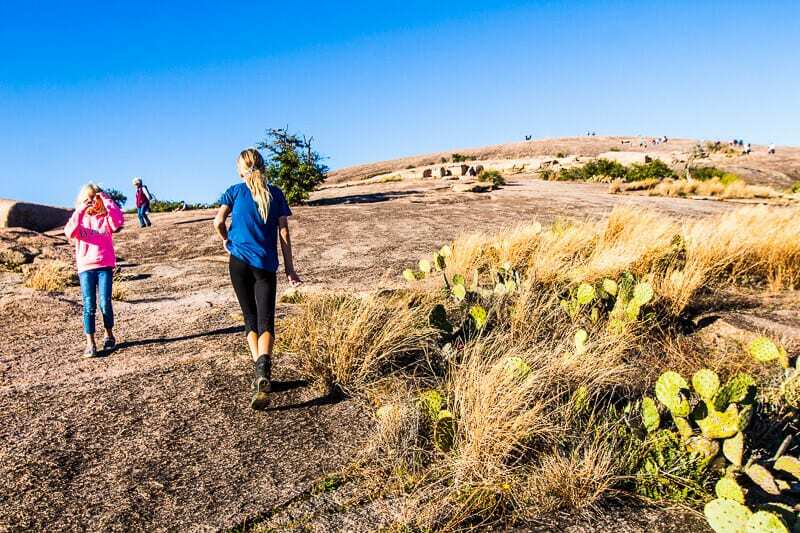 Do you have any suggestions for hiking in Texas Hill Country? 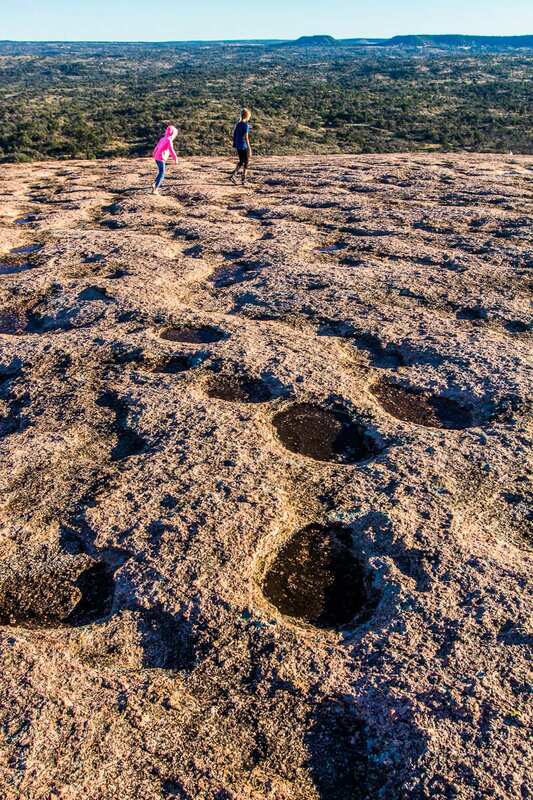 Or for visiting Enchanted Rock State Natural Area Texas? Share in the comments!